Home Ideas Rings Which metal should I choose for my wedding ring? While looking for wedding rings, you should not limit your choices to diamond rings only. Above all, you should consider what kind of wedding rings that match the tastes of you both, for instance your tastes for design styles and materials. There are a wide variety of design styles and materials to look at beyond the monotonous style of diamond gold ring. Here we lump design style and material together because different material often introduces in different design style because of the metal’s special texture. It goes without say that each material has its own pros and cons. While hearing this, you might be wondering how you could tell which one suits you the best. In the following section, we compare and contrast the properties of each material with the hope of giving you helpful tips. Titanium is a grayish white metal which gains a reputation for its wide use in the aerospace industry. Because of its hardness and durability, titanium rings are very popular with people whose works involve heavy manual labor. To give you a sense about its hardness, it is three times stronger than stainless steel, which means that it far outmatches silver, gold or platinum under the same term. Two other factors that contribute to its popularity is its extreme light-weight and its availability in diverse colors including black, grey, silver and colorful colors such as yellow gold, rose gold and blue. 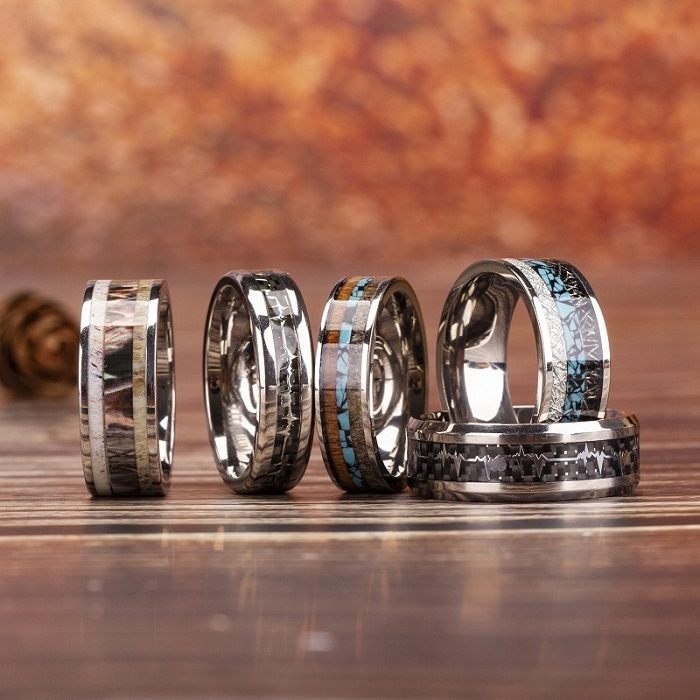 If you do not have the habit of wearing rings, a titanium ring on your finger will constantly draw your attention with its unique luster. However, its strength is a double-sword. On one hand, it leads to its high resistance to scratches. On the other hand, it makes it hard to repair a titanium ring. Or repairing a damaged titanium ring can be costly. Its extraordinary strength also puts limits on the availability of titanium ring styles, which might be sad news for those who are into fashion. Tungsten carbide currently is the most popular material for making rings in the jewelry industry. Owing to its hardness that only diamond can be compared with, it is the most resistant to scratches among all the jewelry metals. It is known for its obvious heavy weight, with which you can easily tell a tungsten carbide ring from rings made from other metals. Rings made of tungsten carbide are often in highly modern styles. In addition, it is available in different colors including black, gray, white, silver, rose gold and blue to name a few. Besides, it is hypoallergenic and highly resistant to chemical corrosions which often happen to gold or silver rings owing to the unavoidable daily contact with soap, hand wash or dish wash. Again tungsten carbide’s hardness is a double sword, which makes it hard to resize or repair. Because of this, free resizing service often comes along with the purchase of a tungsten ring. Finally, when a tungsten ring is stuck on the finger, the usual way is to break it instead of using cutting tools. Of all the precious metals for jewelry making, sterling silver is the most affordable. It is 92.5% pure silver alloyed with other metals, for which it is also named 925 sterling silver. Though other metals are added in order to improve its hardness, it is still prone to scratches. It is very popular for making wedding rings. As it is easily oxidized, a sterling silver ring needs regular polishing to restore its luster and color. In the past, stainless steel was often associated with kitchen appliances or tableware. 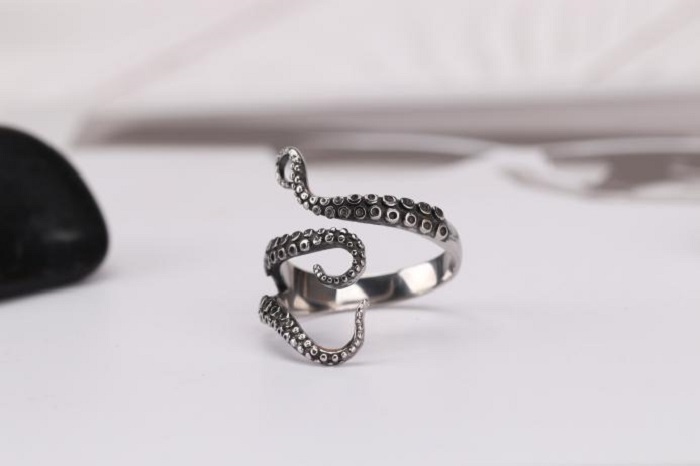 Now it has become increasingly popular with jewelry makers because it is easy to fashion different styles with this alloy which possesses both qualities: hardness and strength. Of course, it is also easy to embed gemstones in stainless steel rings. However, in some conditions when nickel is added in stainless steel to improve its resistance to corrosion, it will trigger skin allergies. Gold, platinum and silver are the classic metals that have been used for making jewelry for centuries. 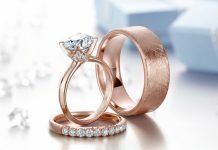 Despite the phenomenon when different metals like tungsten and titanium have risen to take much of the market share, gold is still the most popular choice when it comes to wedding rings. People like gold not only because it can be treated as property. It is also because gold has natural yellow color that appeals to the eyes. Nowadays, there are also rose gold and pink gold available, which are produced when pure gold is alloyed with copper. Though gold would be alloyed with a mixture of metals to increase its hardness, a gold ring would become thin gradually over the years. Platinum is a silver white metal. As platinum is much less mined than gold, it is more expensive than gold. To a certain extent, for jewelry making, platinum is a better choice than gold. It is much harder than gold, for which platinum does not need to be alloyed with other metals to improve its hardness. Furthermore, it does not easily discolor or lose its luster. Rings made of pure platinum are hypoallergenic. However, when other metals like cobalt are added, it would trigger skin allergies. Because of its hardness, it is more suitable for people whose work involves heavy manual labor than gold. 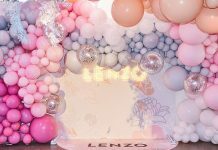 This article was written and submitted by Find U Rings, a reliable jewelry producer specializing in designing personalized wedding rings. It offers free engraving and free shipping worldwide.